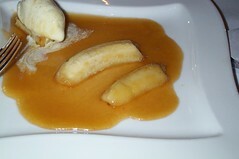 I had Bananas Foster a few years ago when a friend brought it to a party. I couldn’t believe how good it was but then again, I should have. I love bananas. And the best part, it’s so easy to make! Thanks to allrecipes.com for this recipe. Ooh bananas are a luxury item at the moment due to the floods. 12 Aussie dollars per kilo. A work colleague gave me one the other day as a gift, and I took it home and shared it with the kids. That recipe looks delish. I wonder if muscat would be a good substitute for rum? Wow, Narelle, that is unbelievable but I understand. When we had the blackouts in ’04, I think, a sandwich was $11 at the deli near our office! Scarcity drives prices up. That was very nice of you to share it with your children. Muscat might be a nice substitute.